Up until the 1870s, most of the land of the Pocono plateau was pristine forest. The area was full of large trees and dense swamp. The Native Americans called the area that is now Stillwater Lake "Klampeechen Chuppecat," which translates to “deep, dark swamp.” Those early, original inhabitants were the “Minsi” tribe of the Leni-Lenape Indians. As new settlers established themselves on the Pocono Plateau starting in the early 1800s, the rich resource of timber brought lumbermen to the mountain. The swamp area itself was fully cleared of all timber, and its water supply and topography provided opportunity for a man-made dam to be built. Although the exact date of the dam construction is unknown, it was built prior to 1871. First known as "Tunkhannock Lake," the initial purpose of this lake was to provide a water vehicle for timber to flow to the already built Pocono Lake. Known as a "splash dam," the dam would be breached and the resulting flood would carry the logs downstream to the saw mill. During this time, businessmen from New York City and the surrounding areas began buying up the land from local residents and clear-cutting the plateau to harvest the lumber. The small stream that ran through the swampy area was soon dammed to create a lake. 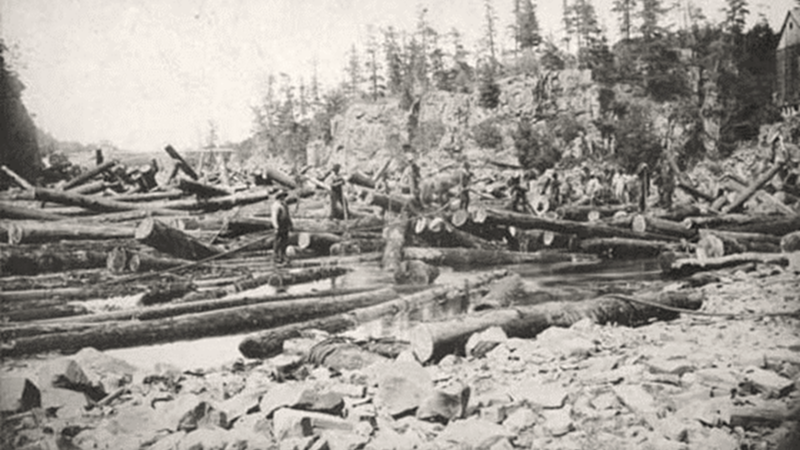 By the 1830s, lumbering was taking place on a massive scale throughout the region. By 1860, Pennsylvania, with over 28-million acres of land (much of which was densely forested) had become America's lumbering champion. In the 1800s, logging was a premiere industry in the Poconos. In 1871 the lake was enlarged to its current size and configuration. Over the years, as timber was cleared from the Pocono Plateau, businesses and major landowners had to look to alternatives for revenues. The long, cold Pocono winters provided an ideal solution: development of the ice harvest industry for refrigeration. Before the technology of electric refrigeration was widely available, people relied on ice to store their perishable foods; and from the late 1880s until the 1930s, the ice industry of the Poconos was king. 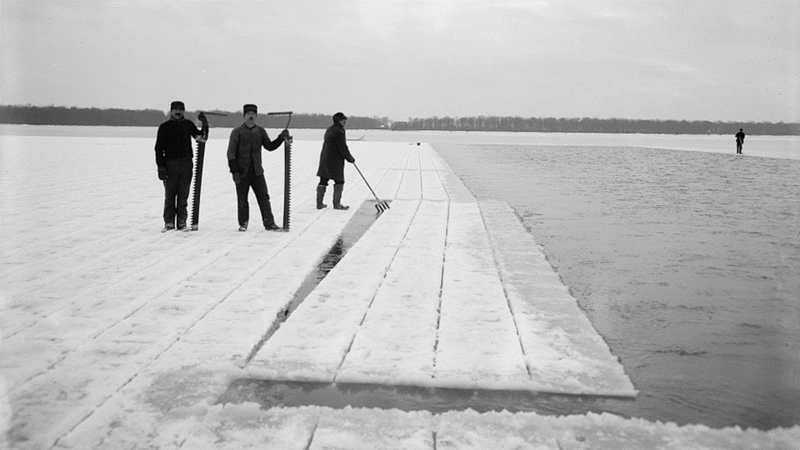 In 1898 the first ice was harvested from Stillwater Lake. The Tunkhannock Ice Company constructed ice houses on the eastern shores of the lake where they could store 70,000 tons of ice; and the Wilkes-Barre and Eastern Railroad built a 1½-mile siding directly into the ice house area to transport the ice. 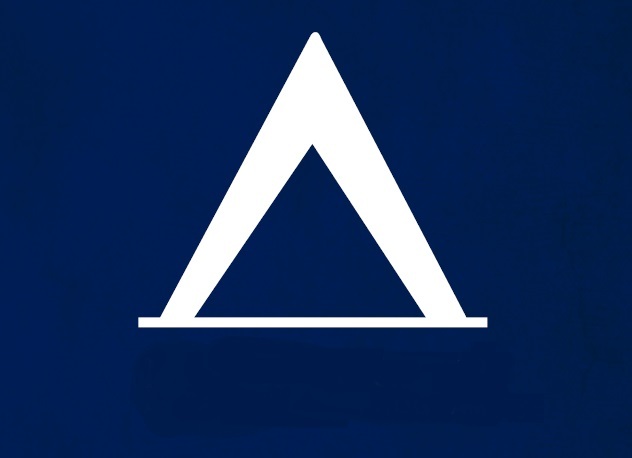 Soon after, in 1902, the ice company merged with the Mountain Ice Company. Run by industrialist Samuel Rubel, the Mountain Ice Company was the leading ice company of the area, supplying ice to New York City, Philadelphia, and many other areas. During the winter, Stillwater Lake freezes to a depth of about 8 to 14 inches thick. And so the ice company would glean the lake for its natural resource of ice. However, with the rise of electric refrigeration in the 1930s, the harvesting of the ice from the lakes became less and less profitable. Eventually, the ice company folded. In the early 1900s, ice was king in the Poconos. 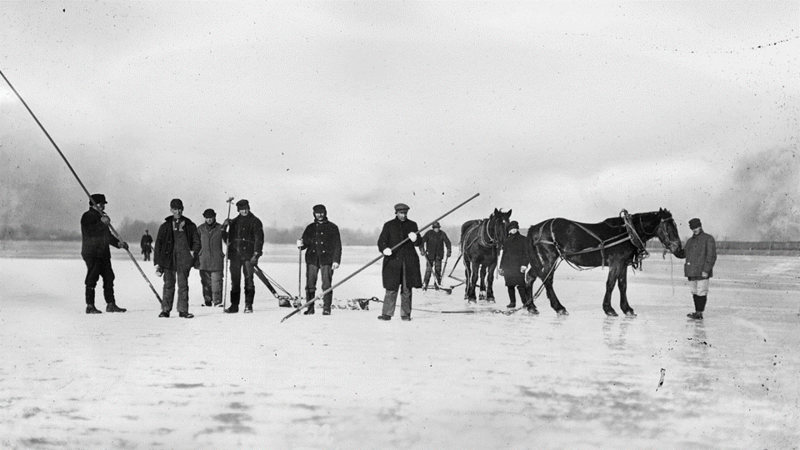 Men worked for $0.30 per hour harvesting ice from Stillwater Lake. The Boy Scouts had camping privileges on the Delaware River at an area know as Weygadt throughout the 1920s, and acquired the land in 1928. 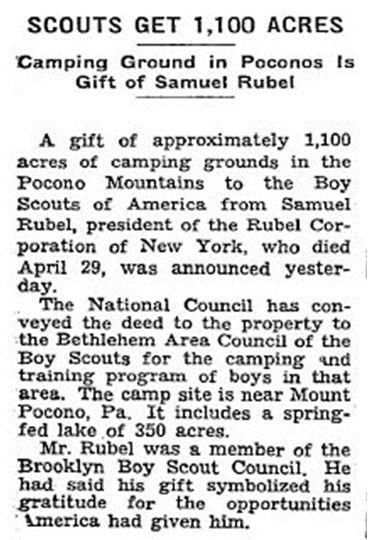 This first Scout camp in the Delaware Water Gap area was the combined effort of two Pennsylvania councils. 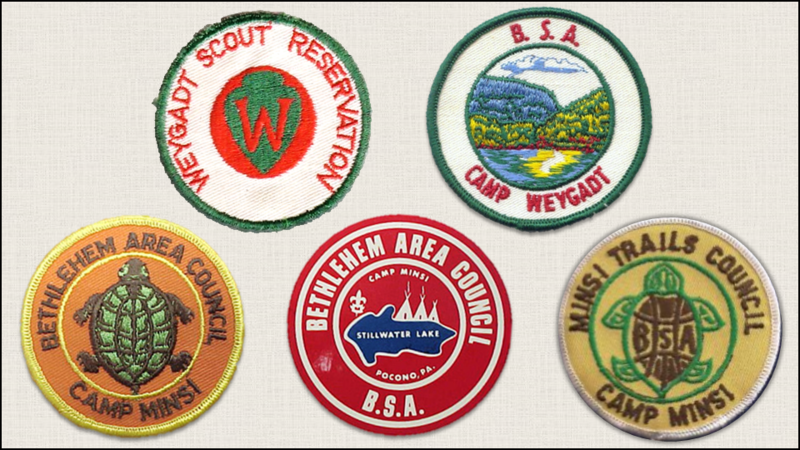 The Easton Area Council used the southern portion of the parcel for its camp named Camp Weygadt, while the Bethlehem Area Council used the north section for its camp named Camp Minsi. In the later part of the 1930s, Bethlehem Area Council moved their camp to the Poconos, and the entire reservation in the Water Gap became Camp Weygadt. Throughout 1920s and 1930s the summer camp for the Bethlehem Area Council traveled from place to place in the Poconos. Once it was held in Tobyhanna State Park. 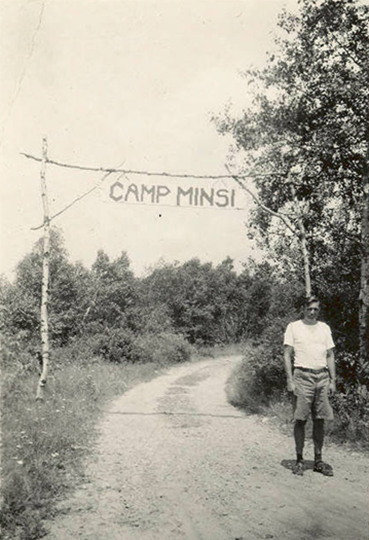 In 1949, Samuel Rubel and the Mountain Ice Company donated the land around Stillwater Lake to the Boy Scouts, and the Bethlehem Area Council was finally able to give Camp Minsi a permanent home. A camp was established on the southern shore of the lake utilizing the facilities of the old ice industry. The exisiting buildings were used for the staff housing, dining hall, health lodge, an indoor rifle range and the ranger’s lodging. However the council sought to expand its programming for summer camp and plans were drawn up for a bigger and better Camp Minsi. In the mid-to-late 1950s the plans were finally realized, chiefly through the donations given to the council from Bethlehem Steel. Construction of the current camp, along the western side of the lake, was completed in 1958 and the newly expanded camp opened for the first time in the summer of 1959. Sadly, in 1968, Camp Weygadt was forced to sell their property due to the impending Tocks Island Dam project on the Delaware River. Camp Minsi and Camp Weygadt reunited as many of the camp's resources and legacies have been able to live on at Camp Minsi. For example, the cannon currently in use in the parade field was originally from Camp Weygadt; and funding from the sale of the Weygadt property have supported many projects at Camp Minsi — including the expansion and dedication of the "Weygadt Trust Dining Hall" in 2007. 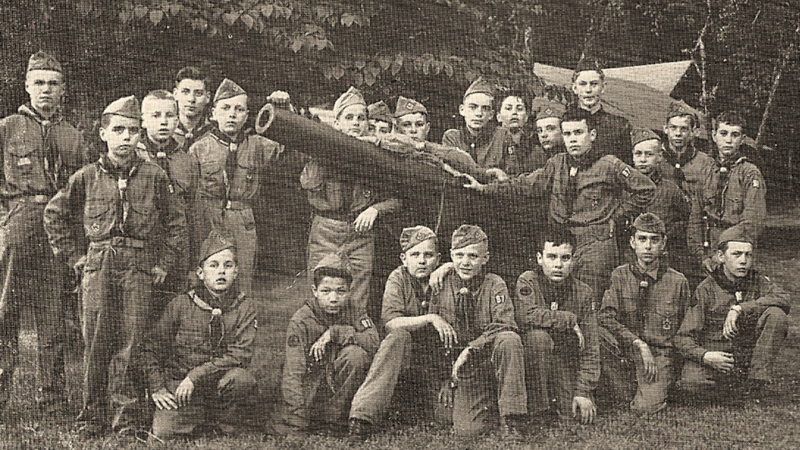 Scouts gather around the cannon at Camp Weygadt. A gateway over the old camp entrance. Camp Weygadt and Camp Minsi patches. 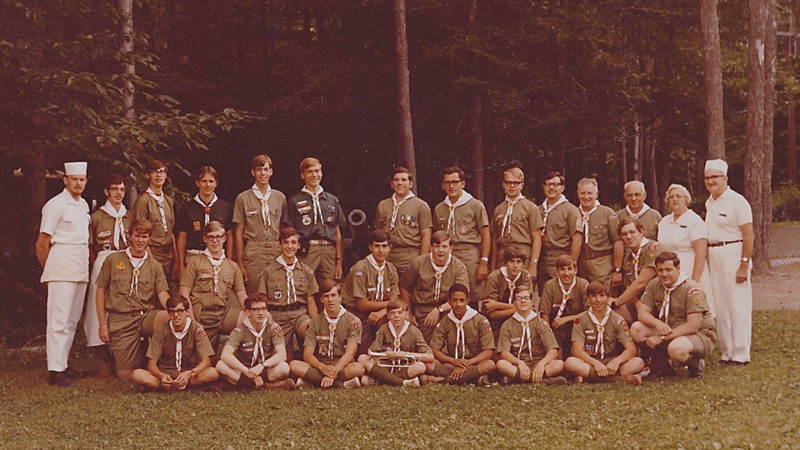 The 1971 Camp Minsi staff. 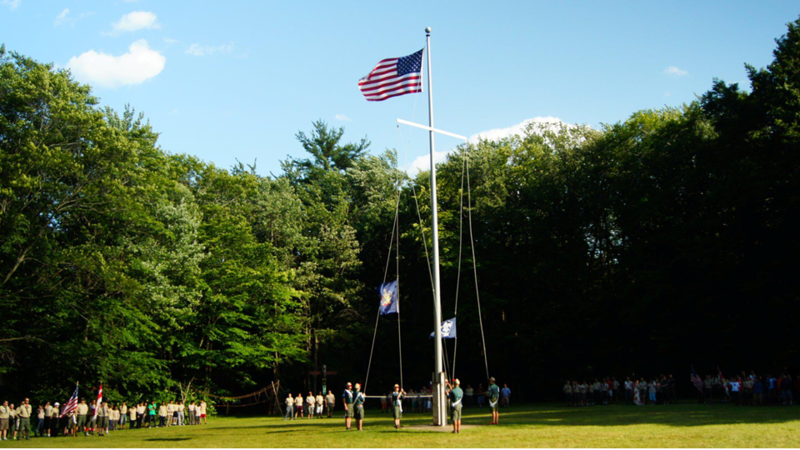 Camp Minsi, now a part of Minsi Trails Council due to the merging of councils, continues to serve Scouts throughout the northeast. Over the past 50 years the number of campsites has increased from the original six sites to ten, and each site has also grown in capacity and design. Several program areas and facilities have been moved and added throughout the years. A "state of the art" central shower house was constructed in 1998. In 2007 Camp Minsi expanded its dining hall by an additional 80 feet. In August 2010, construction began on a renovation of the Stillwater Lake Dam (including a new spillway, gate, and a 400 foot roller-compacted concrete dam). The nearly $2-million project was completed by the spring of 2011, allowing Stillwater Lake and Camp Minsi to continue to serve Scouts for decades to come. 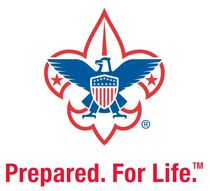 After more than 70 years, Camp Minsi continues to serve Scouts and Scouters from across the country. The most important product of Stillwater Lake, previously used for logging and ice harvesting, is providing recreation opportunities (such as swimming, sailing, boating and fishing) to thousands of Scouts every year.